← Four cousins went to war. 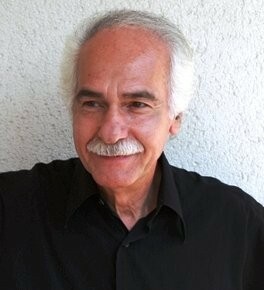 The brilliant Moroccan poet, novelist and playwright Abdellatif Laâbi is the epitome of the engaged writer. Born in Fez in 1942, he studied at the University of Rabat and was one of the founders of the literary magazine Souffles in 1966 which advocated social and political renewal in Morocco as well as cultural commentary and was banned in 1972. His political activity brought him into conflict with the authoritarian regime under King Hassan II in the so-called ‘years of lead’ and from 1972 to 1980 he was imprisoned and subjected to torture for ‘crimes of opinion’. Selections of Laâbi’s poems have been translated into English by André Naffis-Sahely, the latest is Beyond the Barbed Wire, published by Carcanet with support from English PEN. In January 2015, in the wake of the terrorist killings in Paris, Abdellatif Laâbi offered the following poem as a “humble prayer that barbarism may not kill even hope”. This reminder of the necessity to draw a clear line between humanity and barbarism was taken up by many in France and across the world as a resource for hope and solidarity (this translation is mine). Abdellatif Laâbi’s website – with a section in English. This entry was posted in Culture, Education, Poetry and tagged Abdellatif Laâbi, citizenship education, English PEN, France, hope, I attest, Morocco, Poetry, Solidarity, terrorism. Bookmark the permalink. 2 Responses to Abdellatif Laâbi: attesting against barbarism. Thanks as ever, Eddie, for this introduction to a new (to me) writer and for some more light in the darkness. The European Literature course which I’m following at the University of Liverpool (Continuing Education) has majored on French writers for the past two years and, as a riposte to Camus’ L’Etranger, I was pleased to introduce the class to the Algerian writer Kamel Daoud. Connected to that theme I had booked for this http://www.sas.ac.uk/events/event/6673 but unfortunately will now have to miss it as I’ll be just out of hospital having had another new hip! Have a brilliant 2017 (in the circumstances, of course!). Thanks Kevin – wishing you full mobility in 2017!